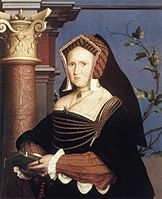 Hans Holbein the Younger (c. 1497 – between 7 October and 29 November 1543) was a German artist, painter and printmaker. He is best known for the portraits he painted. 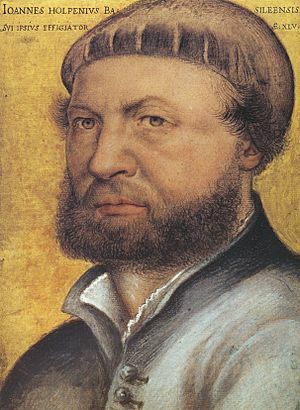 He is called "the Younger" to distinguish him from his father, Hans Holbein the Elder. Hans Holbein the Younger was the better painter. He was a German artist born in Augsburg, and was but he traveled to England in 1526 in find work there. He was a great portrait painter. He also painted some religious paintings. He was a very talented painter who had his own style of painting. He was made to the King's Painter in England. He worked for King Henry VIII. 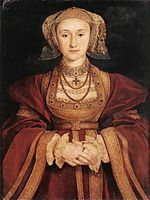 He also worked in England for several famous people, Thomas More, Anne Boleyn and Thomas Cromwell, and painted many portraits of the English royal family and nobles. These paintings show us today the English court life in the time of Henry VIII of England. He was loved and appreciated by his time. Holbein is one of the greatest artists in the art history. His portrait of Erasmus and Thomas More are now very famous. Double Portrait of Jean de Dinteville and Georges de Selve ("The Ambassadors"), 1533. Oil and tempera on oak, National Gallery, London. Hans Holbein the Younger Facts for Kids. Kiddle Encyclopedia.